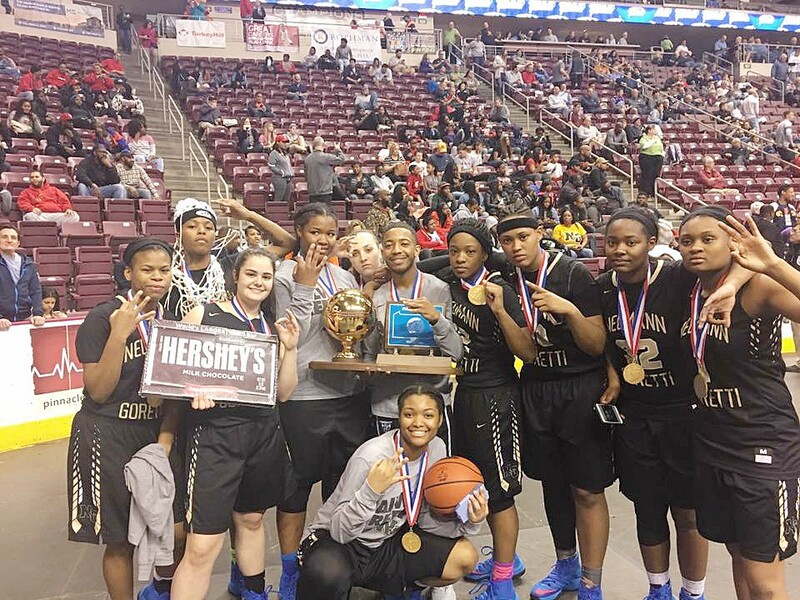 Neumann-Goretti girls basketball team wins sate championship. The Neumann-Goretti girls basketball players strike another state championship pose following Saturday’s win. What would you do with a giant five-pound Hershey candy bar? The sheer thought of wrapping your hands around one makes the idea of trick or treating sound like a complete waste of time. For the Neumann-Goretti girls basketball team, this massive piece of chocolate serves as the sweet ending to another successful season — a state championship. The Saints took the Giant Center court in Hershey Saturday afternoon with their eyes on a third straight Pennsylvania Interscholastic Athletic Association crown. Following a rough start against Bishop Canevin, which included a bitter taste of an early 12-point deficit, the talented East Passyunk Crossing-based squad was not going to let a slow start spoil their plans of another championship moment. Sure enough, the 3A final ended in familiar fashion, a 62–56 victory. Senior guards Ashley Jones and Chyna Nixon, an Ole Miss recruit, were ready to answer the call in the form of a combined 39 points. Jones, who is a West Virginia University signee, had the hot hand from behind the arc, connecting on four three-pointers. But the Saints also displayed a strong defensive effort, forcing 26 turnovers. Neumann-Goretti is no stranger to these nail-biting situations. They are back-to-back defending 2A champs, and a team making its fourth straight appearance in the finals. The 24–5 Saints, who also won the city crown, closed out the afternoon with their hands wrapped around the giant prize pack. “I think they got more excited about the bar than the trophy,” Peterson said with a laugh. Of course, the girls were equally as happy about sharing the state championship spotlight with the Neumann-Goretti boys.